Masahiko Ichino is one of the leading modern ceramic artists in Japan. Based in Tamba, one of the six ancient kilns of Japan, he has gained wide recognition at home and abroad for his creative masterpieces which unite traditional Tamba ware with modern aesthetics, carrying it into the future. Born into a potter's family in 1961, Ichino studied ceramics at Saga Institute of Art, graduating in 1981, after which he apprenticed with Kyoto potter Masayuki Imai. In 1986, he went home to apprentice under his father, master potter Shinsui Ichino, and in 1988, he established his kiln, Taiga Gama, which is still flourishing today. Ichino is one of the few Tamba potters who has succeeded in reviving Tamba's deep red "akadobe-yu" glaze, which was popular during the Edo period and used not only as decoration but also as a slip to seal in water. The glaze was only used for a short time, after which the technique to create it was lost. Thanks to a few Tamba artists who worked endlessly to revive the lost art, the "akadobe-yu" glaze is again synonymous with Tamba ware. 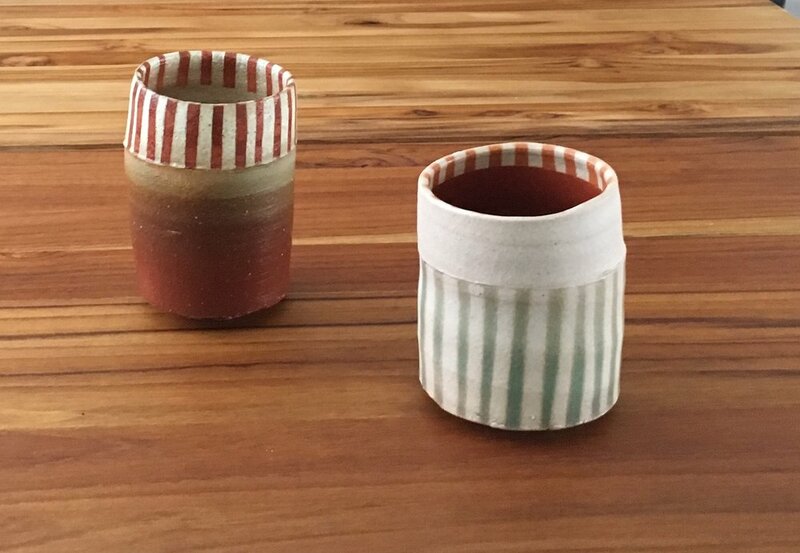 Our collection includes 3 pieces from his bamboo- inspired series, including one akadobe-yu glazed "bamboo" vase and two playful cups with stripes of different colors. Also included in the collection are two vases for which he uses the akadobe glaze as a slip, using a bamboo slip trailer to create whimsical designs. In 1995, Ichino received the Grand Prize by Prince Chichibu at the Japan Ceramic Art Exhibition for his piece "KAI," one of the most prestigious awards for ceramicists. He has submitted works to museums world-wide, including Brooklyn Museum, Victoria & Albert Museum, and The Tanabe Museum of Art, among others. Please visit our Masahiko Ichino items for sale here. You may also read more about Masahiko Ichino in tagged posts on our blog.